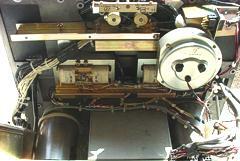 A small, portable machine that used seven-inch reels and 354 electronics (with a different faceplate). 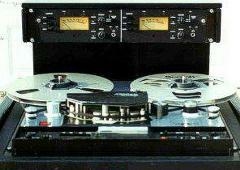 Without any argument the best tube Ampex ever made, probably the best analog tape deck ever made, period. 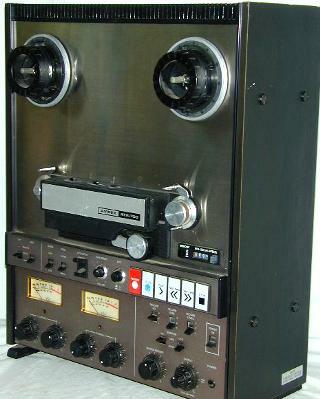 This machine was an all-out effort to make a cost-is-no-object, state of the art recorder. According to a 1966 GSA price schedule in my collection, a two-track, quarter-inch MR-70 in console cost $5456.25 and an identically configured AG-300 cost $3496.00. Transport is similar to the 300, but considerably beefed up. Nuvistor electronics. 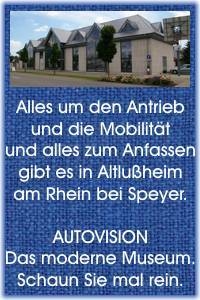 Custom-wound transformers, metal film resistors, film capacitors, etc., etc. Available in many track configurations, up to eight tracks on one-inch tape, and speed pairs of 7.5/15 ips or 15/30 ips. Some track configurations (e.g., two track on half inch tape) anticipate today's preferred analog formats; some configurations were available only on special order. 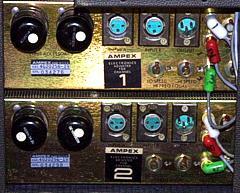 It and the much-despised Model 400 series were the only Ampexes before the ATR-100 to have constant tension. Completely mu-metal shielded. Motor drive to reel idler for faster starts. Allegedly fewer than 100 made. Parts not shared with the 300 are scarce to the point of being impossible to get. According to Bill Vermillion, a Studer engineer once told him that Willi Studer's goal in life was to make a tape recorder better than the MR-70. He tried for two decades; then came to the conclusion that he could equal it but not surpass it. All-in-all, a fantastically elegant piece of industrial design. See Rein Narma and Mort Fujii, "Performance and Reliability Requirements for a Master Tape Recorder," Journal of the Audio Engineering Society, v. 12, no. 4 (Oct. 1964): 274-279 for a full discussion of the rationale behind the MR-70's design. Microphone preamps plugged in to octal tube sockets and usually are not present. 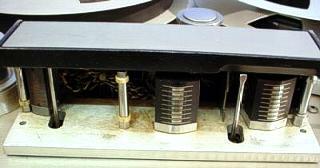 We felt that 1/2" 3-track was a special format that deserved special treatment. 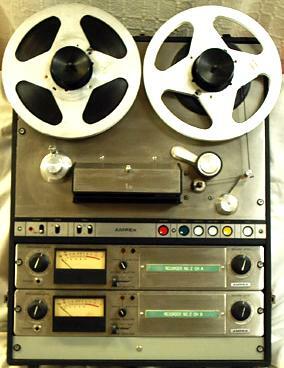 So, we've rebuilt the ultimate 1/2" 3-track machine - the legendary Ampex MR-70. 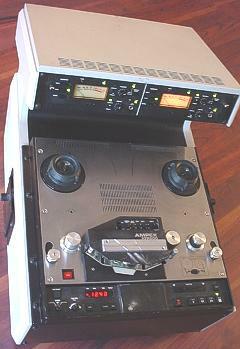 The Ampex MR-70 is the final and best sounding professional vacuum tube analog tape recorder ever built. There are many who feel that the sound of this machine has never been surpassed. 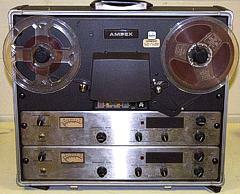 It is believed that Ampex technicians hand-made only 50 of them and that every one was in some way custom-built. The workhorse of the transistor Ampexes. Available in versions up to eight track on one-inch tape. 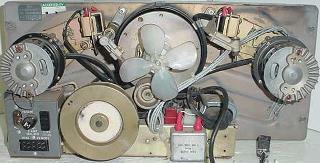 Synchronous or servo capstan motor. No built-in microphone preamps. Multi-channel mastering machines using AG-440 electronics. MM-1000 transport based on the VR-1000 video transport. Available with up to 24 channels. No built-in microphone preamps. An MR-70 for the 1970s and beyond. 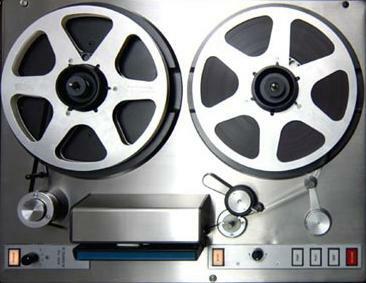 The only analog machine in the MR-70's league. This machine took fourteen-inch reels and could be field adjusted to operate at any two speeds from 3.75 ips through 30 ips (note: speeds do not have to be adjacent). Specifications are at least an order of magnitude better than any other analog tape deck and in many areas rival those quoted for digital. 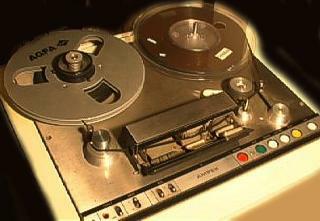 Available up to 24 track on two-inch tape. Later examples were assembled in Mexico. No built-in microphone preamps. 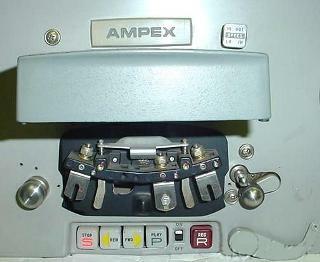 This is an Ampex model AG-500 recorder. AG-500s made from the late 1960's to the mid-1970's. 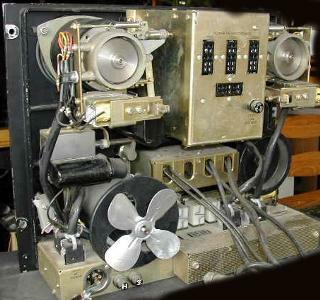 Solid-state version of the PR-10. - AG-600: Transistor update of 600/601/602 decks. The speeds 3-3/4 IPS and 7-1/2 IPS. they are buiklt as mono full track and stereo, in 1/4 track and 1/2 track. Und von hier an roch es alles schon sehr "japanisch". 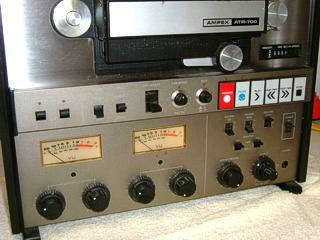 According to Mike Rivers approximately a TEAC 7030 with different buttons and low impedance mike inputs. The same guts appeared as the Tascam 25-2. 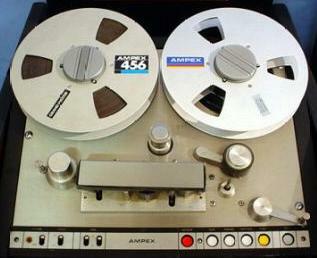 Not a "real" Ampex, and not very desirable. The last of the Mohicans. 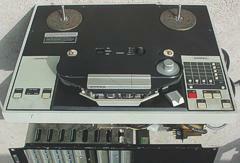 Made in Japan by Tascam but an Ampex design. Sic transit gloria Ampex.